Written over a thirty-year period, the thirteen texts of this book — some of which have been updated, others translated from the original French — address various aspects of Krishna’s childhood in the Harivamsha. As a part of a continuous effort to better understand this oft-neglected complement to the Mahabharata, the present book demonstrates that these stories of Krishna’s childhood were carefully composed by brahmanas who knew fully well what they were doing. 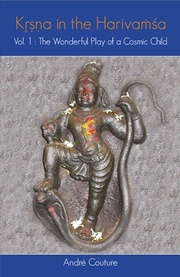 During the ten or so years he spends as a herder in the forest surrounding Mathura, Krishna prepares himself to kill the evil king Kamsa: when packs of wolves spring from the hairs of his body, he manifests his destructive power; he appears as a true avatara when he dives into the Yamuna to subdue the snake Kaliya; he reveals himself as a new Brahma able to create a new world when he uplifts Mount Govardhana with which he has just identified himself, then sheltering cows and herders in his own body. It is author’s contention throughout these chapters that these episodes cannot be dismissed as a hotchpotch of legends borrowed from the Abhiras or similar pastoral tribes. Neither does one do justice to the genre when one reinterprets the story symbolically, as if it were the product of an overactive imagination. Rejecting these positions, the author instead attempts to show here how these talented storytellers carefully crafted a narrative, often using material drawn from their own Vedic tradition, in order to address the new concerns of their audiences.